"Only a Girl" Book Event with Author Lian Gouw, Sat., August 4th! Florey's Books welcomes author Lian Gouw as she discusses her book "Only a Girl"
In 'Only a Girl', three generations of Chinese women struggle for identity against a political backdrop of the World Depression, World War II, and the Indonesian Revolution. Nanna, the matriarch of the family, strives to preserve the family’s traditional Chinese values while her children are eager to assimilate into Dutch colonial society. Carolien, Nanna’s youngest daughter, is fixated with the advantages to be gained through adopting a Western lifestyle. She is proven wrong through her turbulent and ultimately failed marriage and by the consequences of raising her daughter in the Dutch culture. Jenny’s Western upbringing puts her at a disadvantage in the newly independent Indonesian state where Dutch culture is no longer revered. The unique ways in which Nanna, Carolien and Jenny face their own challenges reveal the complex tale of Chinese society in Indonesia between 1930 and 1952. Lian Gouw was born in Jakarta, Indonesia, then a Dutch colony known as the Netherlands’ East Indies. Lian’s short stories and poems have appeared in Quietus Magazine, Writing for our Lives, Voices and Visions, The Highland’s Low Down and Reflections. 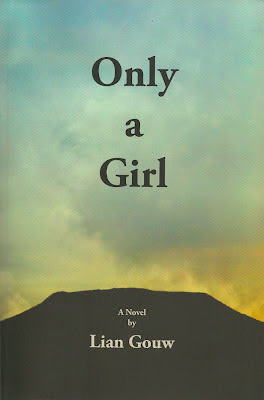 Her Predicament, an earlier version of the first chapter of her novel, Only A Girl, was included in the 2006 anthology of the SF Writers Conference, Building Bridges from Writers to Readers. In her writing, Lian explores themes of human relationships, connection with animals, and fable-like fantasy. She is particularly interested in the lives and struggles of women. 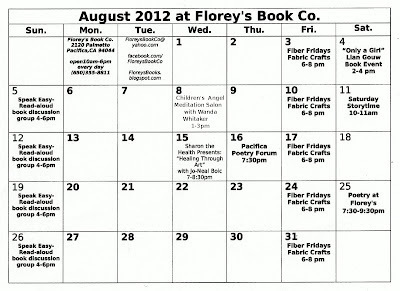 August 2012 Calendar of Events at Florey's! 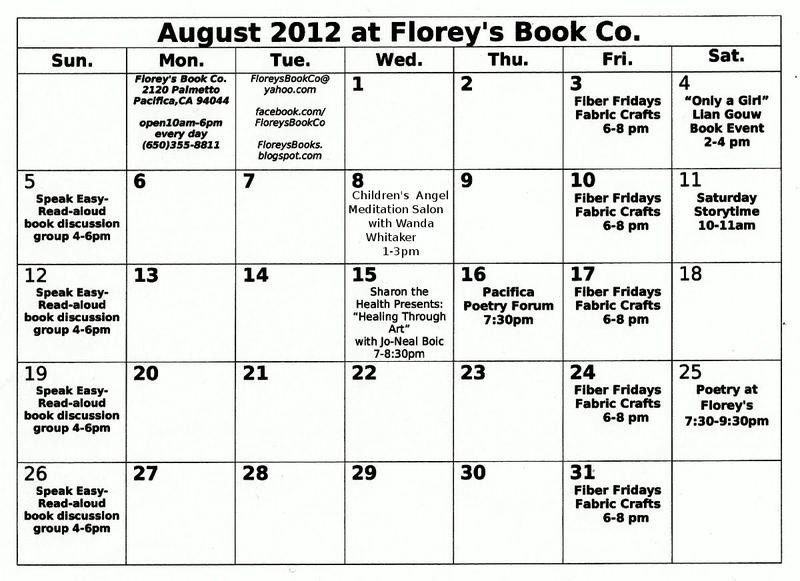 Here is the August 2012 calendar of events at Florey's Book Co. 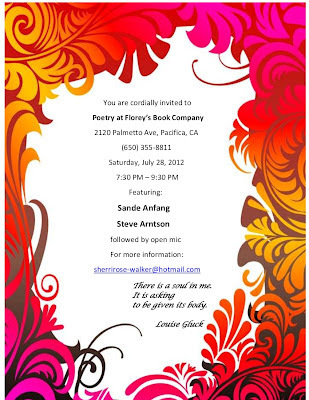 The featured poets this month are: Sande Anfang and Steve Arntson. The featured poets will be followed by an open mic period. Open mic sign-up is first come, first served. This event is also open to the public and free of charge. 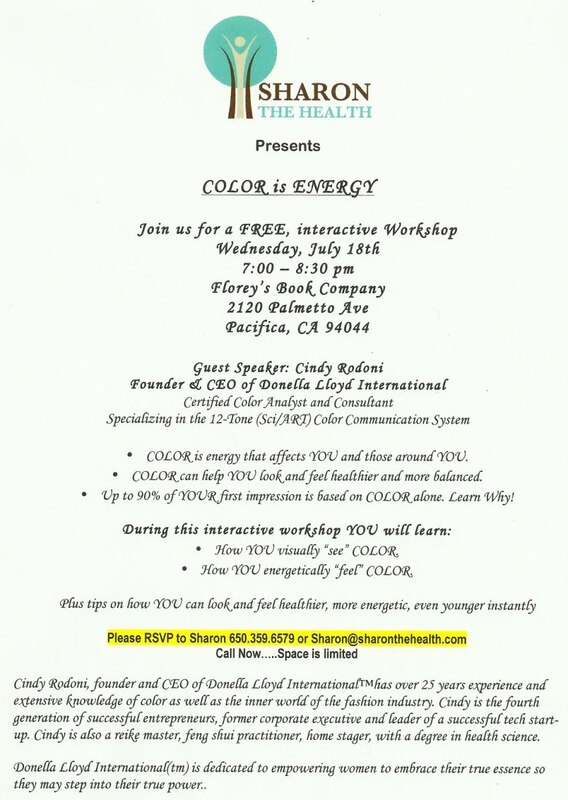 Sharon the Health Presents: Color is Energy, Wed. July 18th at Florey's! Florey's Book Co. welcomes Sharon Caren of Sharon the Health and guest speaker Cindy Rodoni. 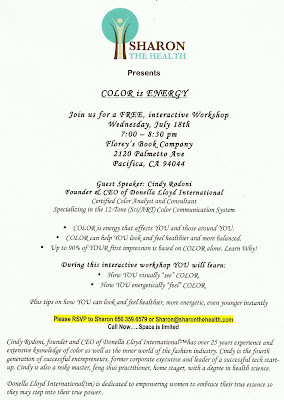 She will lead a free, interactive workshop on the topic "Color is Energy". -Color is energy that affects you and those around you. -Color can help you look and feel healthier and more balanced. -Up to 90% of your first impression is based on color alone. Learn why!